Amelia B. Zelnak, M.D., M.Sc. Dr. Zelnak is a board-certified hematologist and medical oncologist with expertise in treating solid tumors, blood cancers and hematologic disorders. She completed training in internal medicine and was a fellow in hematology and oncology at the Emory University School of Medicine. 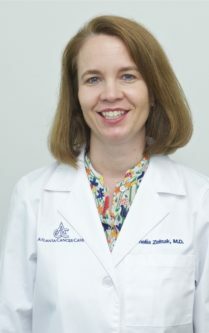 Prior to joining Atlanta Cancer Care, Dr. Zelnak was part of the faculty at Emory University in the Department of Hematology and Medical Oncology. Dr. Zelnak is part of the Northside Hospital Breast Care Committee, Northside Hospital Cancer Institute (NHCI) Breast Research Work Group, NHCI Research Advisory Committee, Susan G Komen Atlanta Advisory Council, and the Georgia NCORP Clinical Research Team. Board Certifications: Internal Medicine and Medical Oncology and Hematology. Jegadeesh, N., Kim, S., Prabhu, R.S., Oprea, G., Yu, D., Godette, K.G., Zelnak, A., Mister, D., Switchenko, J., Torres, M.A. The 21-Gene Recurrence Score and Local Recurrence in Breast Cancer Patients. Ann Surg Oncol. 2015 Apr;22(4):1088-94. Davis CC, Zelnak A, Eley JW, Goldstein DA, Switchenko JM, McKibbin T. Clinical Utility of Routine Cardiac Monitoring in Breast Cancer Patients Receiving Trastuzumab. Ann Pharmacother. 2016 Sep;50(9):712-7.